Who was the 5th army in The Hobbit: The Battle of the Five Armies? In the book, it's the Wargs. it was called the Battle of Five Armies, and it was very terrible. Upon one side were the Goblins and the wild Wolves, and upon the other were Elves and Men and Dwarves. The Eagles just turned up out of the blue. See also here. In the ... did they really make three Hobbit films??! Disclaimer: I know nothing about the film. The following list is copied from @Keen's answer. Men from the Lake Town under Bard. Elves from Mirkwood under Thranduil. Dwarves from the Iron Hills under Dain. Orcs from Dol Guldur, under Azog. Orcs/goblins from Gundabad, under Bolg. “So began a battle that none had expected; and it was called the Battle of Five Armies, and it was very terrible. Upon one side were the Goblins and the Wild Wolves, and upon the other were Elves and Men and Dwarves. This is how it fell out." Men (i.e. plain ole' humans) from the Lake Town, under Bard. And also the Eagles and Beorn show up, who swiftly defeated that final army. That the 5th army are a 2nd army of Orcs and goblins is a significant change from the book. In the book, all the Orcs/goblins come from Gundabad, as Azog was dead in the book at this point in time, having died in the battle where Thorin earned his title of Oakenshield. And also the Dol Guldur plot line was less significant. In the book, the one force of Orcs from Gundabad included Wargs and bats. This seems (to me, at least) a canonical source as far as the movie is concerned. The image was originally published in this Entertainment Weekly article. “Tolkien uses eagles in a way that can be kind of awkward because they tend to show up out of the blue and change things pretty quickly,” says the director. “So here they’re just part of the plan, not the saviors. [...]"
sounds (to me, at least) as a confirmation that the eagles are considered one of the armies, and not just a deus-ex-machina. 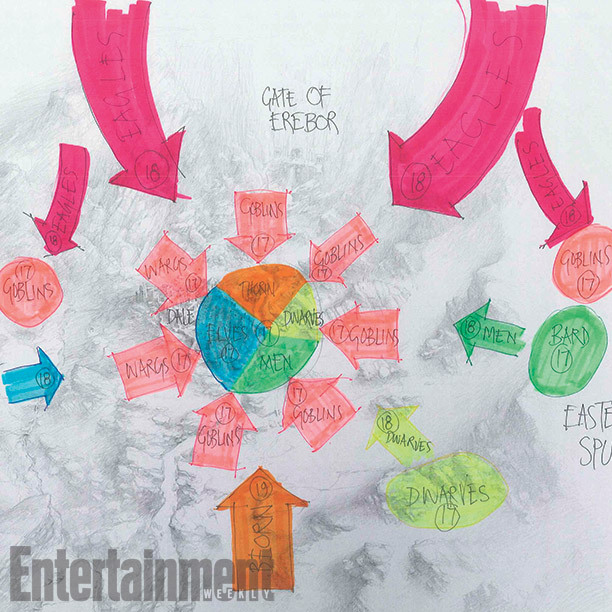 The map in EW’s article shows six different colour-coded groups – goblins and wargs are one colour, with eagles, elves, men and dwarves each having a different colour. This would seem to confirm what we at TORn have speculated in our panel presentations at various conventions – that Jackson’s five armies will in fact be men, dwarves, elves, orcs and eagles, with the wolves/wargs being a part of the orc army. 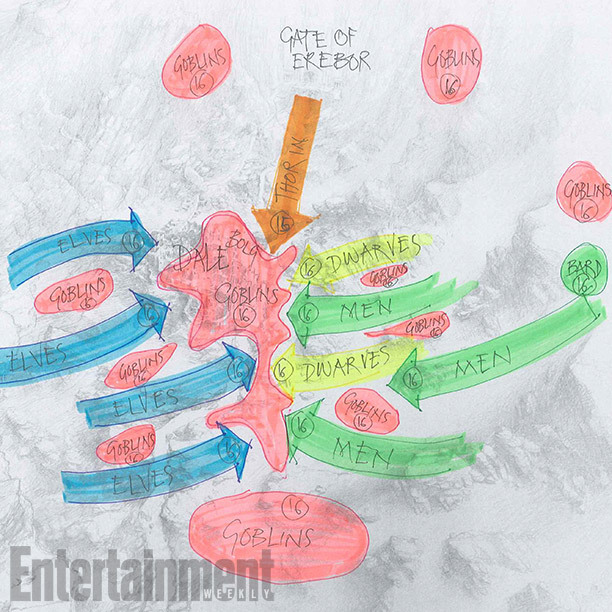 The sixth colour on the diagram is for Beorn and Thorin – perhaps to highlight the key players of the battle (although Bard, though having his own spot on the schematic, does not share this orange colour – and it’s interesting to note that Dain, surely a key player, is not mentioned by name on this map; nor is Azog). The EW article itself is still online, but I cannot see the images anymore. I was able to retrieve the missing image thanks to google, who pointed me at this Collider article citing and quoting the EW one, together with the map. This article on a french site has some translated passages from the EW article together with another battle map, depicting a previous moment. Another secondary evidence supporting the eagle theory, this time coming from the "To Which Army Do You Belong?" test recently linked from the movie facebook page. The book seems to say, before the start of the battle, that the 5 armies are the Goblins (same as Orcs? ), wild Wolves, Elves, Men and Dwarves. If that’s what the book is saying, then the Eagles, who do not appear until the end of the battle, are not included in the 5 armies. Also the book mentions only one Goblin (Orc) army, not two. Since the movie didn’t seem to have an army of Wolves/Wargs (it only showed a few of them), maybe the second Orc army under Azog was added to replace the wolf army in order to keep the number of armies at 5 and be consistent with the title. Then the 5 armies would be the Elves, Men, Dwarves, Orc army under Bolg, and Orc army under Azog. In the movie they seem to be using 2 armies of Orcs. One from Moria which are the first Orc army to arrive on the battleground and the second, the Orcs from Gundabag, as the second army of Orcs attacking from the North. The animals. Gandalf specifically tells Radagast to gather them, as they will be needed to fight the coming evil of Sauron's forces. It's made clear both in his directing Radagast to assemble them (and not just eagles and Beorn; there were more animals) and in them coming at the end to turn the tide. There is absolutely no focus on the wargs or wolves in the film. So it's the dwarves, elves, men, Sauron's forces of orcs, goblins, and other nasty creatures ... and the animals. Not the answer you're looking for? Browse other questions tagged tolkiens-legendarium the-hobbit the-battle-of-the-five-armies or ask your own question. Does using the Black Speech attract the Eye of Sauron? How important was the victory at the Battle of the Five Armies? Why did Dáin hold half of his forces back in the Battle of the Five Armies? In The Hobbit, what was the original purpose of Sauron's army?